When a loved one is in the hospital, simply getting outside and mingling can be therapeutic. Fisher House residents can relate as their ill or injured military-veteran family members receive care in nearby hospitals. To help foster smiles and a sense of community during the summer, ROSS Companies partnered with Apartment Restorers to host a cookout at Fisher House on July 1. The cookout included ribs, hotdogs, chicken, potato salad, chips and sodas and feature cooks and servers from Apartment Restorers. ROSS Companies decorated the Fisher House grounds in red, white, and blue Independence Day materials and provided all the paper products for the event. The event is one of many activities ROSS Companies has coordinated or assisted with to help Fisher Houses throughout the region. On June 17, ROSS Companies delivered 72 gift baskets to Fisher House, a collection of multi-item baskets assembled by children of ROSS Companies associates on bring-your-child-to-work day. In April and May, ROSS Companies collected a large number of donations through a household-items drive and all collected items were donated to Fisher House Bethesda. 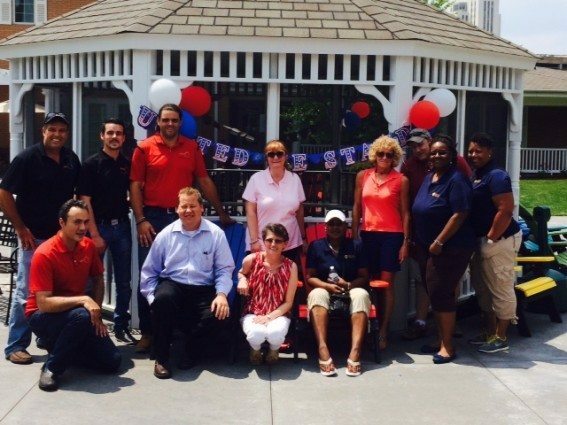 In July, the corporate office of ROSS Companies hosted an Ice Cream Social fundraising event with all proceeds donated to Ft. Belvoir Fisher House. Fisher House, which provides housing for the families of sick and injured active military and veterans, relies on companies such as ROSS for donations to ease the burden for families when their loved ones are receiving treatment. ROSS has plans to give more of the company’s time and resources to the organization throughout the remainder of 2015, including a summer cleanup at Fisher House Bethesda on July 23, which will include power washing porches and banisters, trimming bushes and applying touch-up paint to Fisher House No. 5. Fisher House Foundation is best known for a network of comfort homes where military and veterans’ families can stay at no cost while a loved one is receiving treatment. These homes are located at major military and VA medical centers nationwide, close to the medical center or hospital they serve. Fisher Houses have up to 21 suites, with private bedrooms and baths. Families share a common kitchen, laundry facilities, a warm dining room and an inviting living room. Fisher House Foundation ensures that there is never a lodging fee. Since inception, the program has saved military and veterans’ families an estimated $235 million in out-of-pocket costs for lodging and transportation.